There’s a huge benefit to the Nova Communications team welcoming co-op students. Our offices have welcomed students from various education programs for years (in fact, we can’t remember a time when we haven’t had co-op students working in our offices). But it’s not only Nova Communications that benefits from these experiences. The students do, too, and our most recent co-op student at our Halifax office, George Faraj, said the benefits he’s seen so far, and it’s only been a month, have been vast. “Of all the co-op jobs that are being offered, they were all too focused on hardware. Nova really wanted to challenge me to develop both in terms of hardware and software, which was a huge pull for me to take it,” he said. George, who was born and raised in Honduras, is a third year computer engineering student at Dalhousie University. 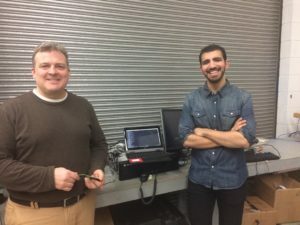 He has been working with the Engineering department at Nova Communications, as part of a team developing a prototype for remote monitoring of repeaters and sites. And he’s been thrown right into the project, which has George visibly excited about the experience thus far. He’s also enjoyed working on things like setting up sensors, micro controllers, and creating connections with servers. He has wired up sensors to make his work come together – a challenge he’s interested in outside of the classroom at school. Goals for the next three months at Nova Communications for George are to see and understand more about mathematical modeling and strengthen his code base even further than it already has been in his short time with the team. With the experience he’s gained from Nova, George will finish his degree at Dalhousie next year and plans to apply it to places around the world, giving him an opportunity to travel at the same time. Ultimately, he hopes to be involved in robotics at some point, and embedded system designs, which he says Nova Communications has contributed to. George will be with our team until the end of April. Welcome to the team, George!